The reclaimed wood that ends up in Colorado started it's journey as Wisconsin Barn wood. Yes 100% of it. Our wood has a story. It starts with a family, our family, and ends as a part of your family. We believe it's important you know where the wood came from and the type of wood we carry. Everytime you come to our shop we have "wood bio's" available for you to take home with you. These "tobacco brown" boards were the boards that made up the roof of the barn. The "naily" holes were the nail holes that shingles were nailed to. The moisture that leaked thru the barns at the end of their life is what gives these boards their unique movements. The Tobacco Naily reclaimed wood boards have 2 sides that can be used depending on the looks you are going for. One a more rustic weathered look and the other a "cleaner" and deeper brown look. All boards are denailed, squared, free of debris and full of character. The grey weathered siding is our most popular siding. It was used on the sides of barns. Many of these boards were once red and has faded off with time. Some boards show dashes of red and many are just straight grey. In the shop we carry shiplap, wide 12"+ and thinner 8" (and similar) smaller. The wide siding is from trees that don't grow that wide any more and are sold at a premium. The unique thing about these boards is that either side can be used - the red the brown or both together mixed. We usually carry "Shiplap" style where the boards lock together. 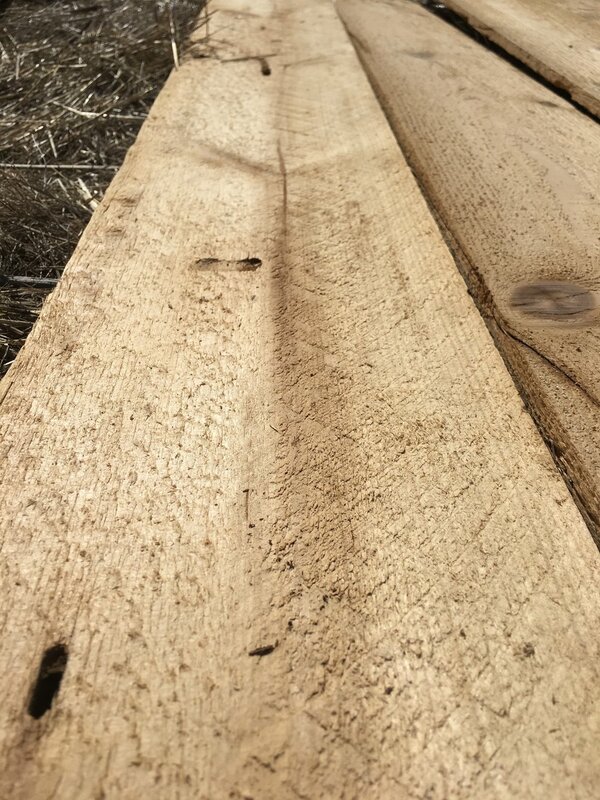 This is Re-Sawn reclaimed virgin timber from the walls of the barn. The widths, lengths height (average 1/2 inch) will vary from piece to piece. This wood looks much less weathered than the other wood we carry but each piece does have unique characteristics to it. Can be used to create a rustic "log-cabin" feel or even a "cleaner" reclaimed look. We do carry a plethora of other types of wood for whatever project you are working on. Stop by the Retail Shop and find the one the meet your need!